1. Where can I find information on the boards and commissions to which the Governor makes appointments? A listing of state boards and commissions may be found at Governor Parson's Boards and Commissions webpage. There are various search functions on this page which will allow you to search for vacancies, expired terms, terms expiring within 60 days, and departments the boards are under. By clicking on any board or commission listed, you can find detailed information on its function, qualifications for membership, the current composition of the board, when members’ terms will expire, frequency and location of meetings, etc. You may also find a link to the board or commission’s own website, which will allow you to browse recent meeting minutes, annual reports, or other information. We strongly recommend that you thoroughly research a board or commission prior to submitting your application. 2. How do I apply for a gubernatorial appointment to a state board or commission? Governor Michael L. Parson encourages all Missourians to participate in their government, and seeks qualified candidates for appointments to state boards and commissions. A current Application for Gubernatorial Appointment is required for consideration of any candidate seeking appointment by Governor Parson. Applications can be completed online at https://apps1.mo.gov/boardsapp/. Registration is necessary to complete an Application online. Basic information including email address, name, and phone number are required when registering. Upon submitting your registration, an email will be sent to the email address you used to register. This email contains a link you must follow to complete the registration process. Clicking the link in the email opens a web page on which you enter your password. After the registration is complete, you can return to https://apps1.mo.gov/boardsapp at any time to logon to the online Application to complete or update it. Logging on requires the same email address and password used during your registration for your online application. While completing the application online is preferred, a paper application may be obtained at http://boards.mo.gov/Docs/BOARDS_AND_COMMISSIONS_APPLICATION.pdf or by contacting the Governor’s Boards and Commissions Office at (573) 751-3222. Please follow the instructions on the Application carefully and provide all information requested; if a question does not apply, please write in “not applicable”. Incomplete or unsigned paper applications will not be considered. The Application and the attached Releases must be signed by you (and, if applicable, your spouse) before any candidate will be considered for an appointment. A current resume is required of all applicants, and is not a substitute for the information requested on the Application form. If you applied or were appointed under a previous governor’s administration, you will need to complete the current application and submit a resume and photograph to be considered for re-appointment. Your application should be submitted electronically. Additionally, you will need to submit signed executive and senate releases, resume and photograph. If you completed your application online, you can upload release forms, reference letters, a resume and a photograph while you are online. You will be prompted to do so when you successfully complete your application. You can also click “Tools” menu and then "Upload Files". Please note: Your application is NOT complete until you submit your signed executive and senate releases, resume and photo. Upon receipt of your signed executive and senate releases, resume and photo, your application will be entered into our database immediately. Any additional information received from you or from others relative to your application will be kept in your file. If we need additional information, we will contact you. 3. Do I need to submit letters of recommendation with my application? Letters of recommendation are not required; however, if there are people who would like to express their support for you, you may ask them to send letters of endorsement to the Governor’s Office of Boards and Commissions. These letters will be retained in our database with your application materials. 4. What can I expect after my application information is submitted? When it is time for the Governor to make an appointment in which you have expressed interest, the Office of Boards and Commissions reviews statutory requirements that pertain to the appointment and gathers information on professional or personal experience necessary or preferable for the position. We also look at the composition of the current board. The background and qualifications of all applicants are then reviewed. All potential nominees undergo background checks, including a tax compliance review, criminal records check, and review of credit history. For appointments subject to confirmation by the Missouri Senate, we must obtain a letter of support from the potential nominee’s sponsoring Senator prior to formal appointment by the Governor. Recommendations are made to the Governor, who makes the final decision on all appointments. You will be contacted by Boards and Commissions staff if you are selected for an appointment. Unless you request otherwise, all application files will be retained for consideration for future appointments; please contact the Governor’s Office of Boards and Commissions should you wish to withdraw your application from further consideration. Please remember to update your application and/or resume if you move, change employer, etc. 5. How can I determine which boards and commissions have openings? Governor Parson's Boards and Commissions webpage contains the most accurate and up-to-date information on vacancies and expiring terms, and is updated as new appointments are made. You may search for vacancies and or expired terms by clicking the links to view the list of current vacancies and expired terms, or terms that will be expiring within the next 60 days. By selecting a specific department, the search will be narrowed to only boards within that specific department. Generally, under Missouri law, appointees whose terms have expired continue to serve until they are reappointed or replaced. Vacancies can occur at any time due to a resignation or death of an appointee, so check the Governor’s website often. 6. Will my appointment be subject to Senate confirmation? 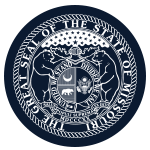 For the majority of boards and commissions, state law requires the Governor’s nominee to be approved or “confirmed" by the Missouri Senate. The Senate considers appointments only when it is in session, which is generally January through May, or when the Governor calls a Special Session. If your appointment is subject to Senate confirmation, you will be contacted to come to the State Capitol Building in Jefferson City to appear before the Senate Gubernatorial Appointments Committee. The purpose of the hearing is to permit the Committee to determine whether you are a qualified and competent nominee; at the conclusion of the hearing, the Committee may vote to send your nomination to the full Senate for approval. Appointments made by the Governor when the Senate is in session must be confirmed before the nominee may commence his/her service on the board or commission. Appointments made when the Senate is in recess are subject to confirmation when the Senate reconvenes, but the appointee may commence service immediately. 7. Do I have to disclose any personal financial information after I receive an appointment? Many boards require the disclosure of personal financial information by filing a Personal Financial Disclosure Statement with the Missouri Ethics Commission within thirty (30) days of appointment by the Governor, regardless of the date of Senate confirmation, and annually thereafter. Please contact the Missouri Ethics Commission or the Governor’s Boards and Commission staff to determine whether your board or commission is subject to this requirement. 8. Will I have to meet certain minimum requirements to be considered for an appointment? Current in payment of all local, state, and federal taxes. Please consult the Governor’s Boards and Commissions webpage for information on a specific board or commission to ensure you meet any additional statutory requirements such as residency in a particular Congressional district, occupational or professional licensing, political party affiliation, etc. 9. May I apply for appointment to more than one board or commission? You may apply to be considered for appointment to many boards as you wish. Once appointed to a board or commission, you may apply for another appointment; your application will be considered in light of the demands of your current board service and other responsibilities. 10. Why does the Application seek information on my ethnicity? Governor Michael L. Parson believes that state boards and commissions should reflect the geographic, gender, and ethnic diversity of Missouri. The information we request in the Application will be used to ensure this goal is met; it will not be used for any discriminatory or other illegal purpose. 11. Why do I have to disclose my political affiliation in the Application? Many boards and commissions are required by law to have political balance, with a certain number of members from each of the major political parties. By disclosing your political affiliation, you help us determine whether your appointment would satisfy these requirements.